Eagle Editions' series Wings of the Black Cross is now in its tenth edition. The latest edition is a softbound book with 36 high gloss pages. Inside the front cover is an addendum and errata sheet from the previous volumes. This is a professional approach, as new information is constantly being discovered by other researchers. The highlight of all of these books is the photos, and this volume contains 62 black and white photos of the highest resolution. They are clearly printed and quite useable. Most of the photos have never before been seen. There are some that I've seen elsewhere but these reproductions are superior in clarity. There is something in here for everyone. If you are like me and love the 109, there are plenty of them to be had, and not just the early versions. Pips Priller's E-3 is shown in a very nice photo that should inspire a diorama. Focke Wulfs are well represented, including a very unique-looking F-9. Bf-110s and Me-262s are also presented in some very unique situations. There are some Bf-110s mounted on train cars for transport that I've never seen before. Some He-177s and He-111s show off some unique markings that I haven't seen before. Some Condors and Ar-232s are included. The Ju-288V2 prototype is very clear in four photos. The remainder of the aircraft - FW-189, He-219, Ju-87s, Ju-290 and Ju-88s - show some nice markings. There is a very unique Ju-52 with what looks like a DB or Junkers manufactured engine and three bladed prop in the nose. I've never seen that installation before. It would make a unique-looking model. 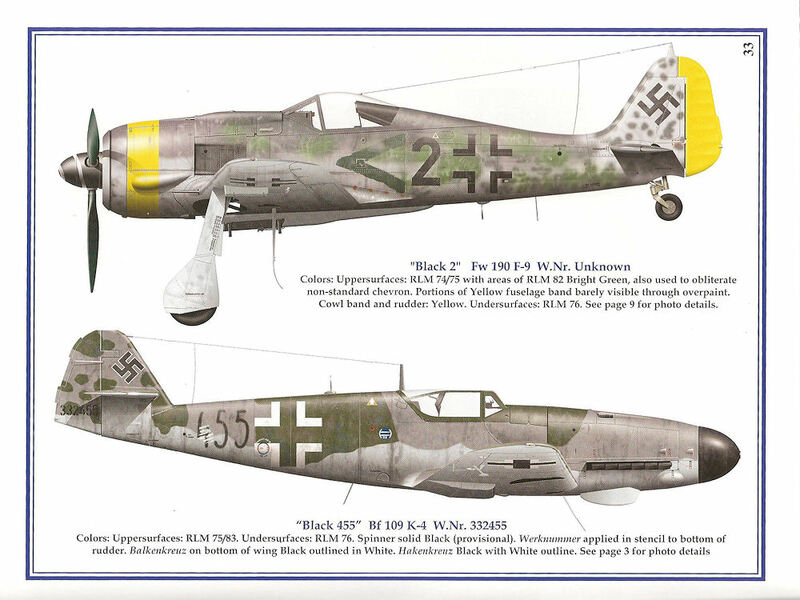 The photos are rounded out with some Luftwaffe types from the Enemy Aircraft Flight. Each photo is captioned to explains what is being illustrated. In a few instances, there are references to previous volumes...a nice touch to complete the picture. There are eight color profiles at the back of the book that illustrate some of the aircraft from the photos. They are done by Tom Tullis, so you know they are great. The back cover has two color photos. One illustrates the Fi-103 quite nicely. There is mention of a Ta-152H-1/R11 being in the photo but I can't make it out. 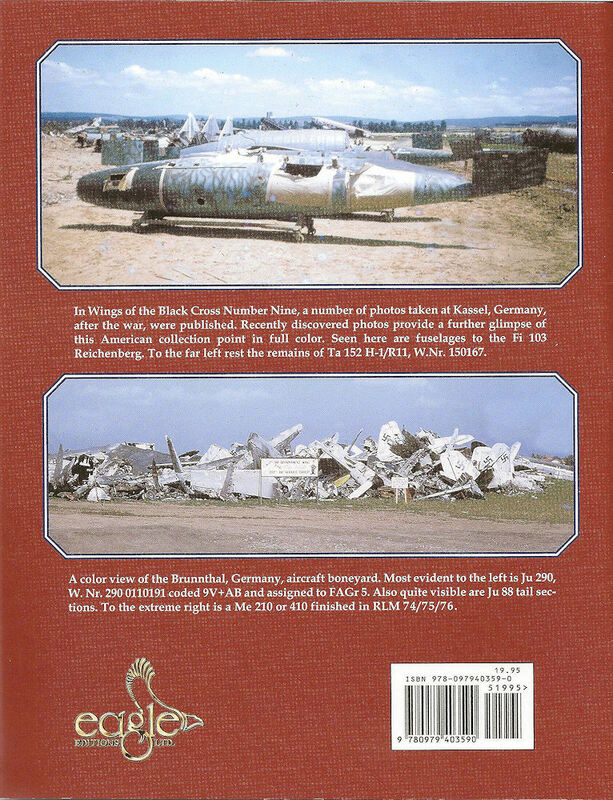 Typical of the Wings of the Black Cross series, this book contains high quality photos and world class color profiles presented in a professional manner. This, and the other volumes, represents a great value for the money. 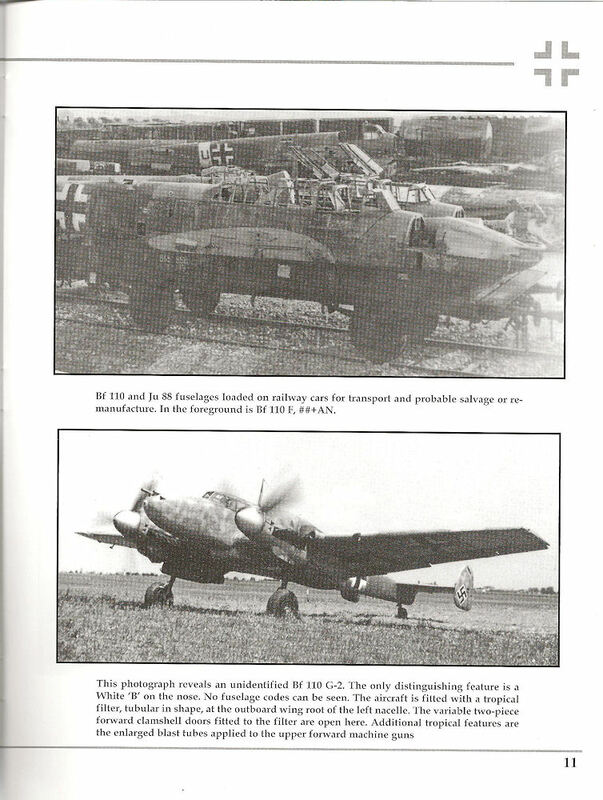 If you love Luftwaffe aircraft, then don't let these volumes be absent from your library. I can't wait to see what comes out in future volumes. Thanks to Eagle Editions and IPMS/USA for the review copy.